Leftist propagandist Chuck Todd always asks his questions in such a way as to include multiple attacks within what should have been just an unbiased question for a network “news” guy. In his interview with House Majority Leader Kevin McCarthy, Todd is up to his usual tricks, including cutting off answers he doesn’t like or replacing them with new questions that might prove more “productive” for him in his endeavors to advance the globalist cause. He asks, “Do you want the President to declassify this memo that was written by Republican staff on the House Intelligence Committee?” He could have phrased it as “exposing corruption at DOJ” or being based upon information provided by the FBI and DOJ, rather than attempting to give the impression that it is made up garbage along the lines of the Democrat’s fake dossier. He points out that the Justice Department will be able to see it, “Because you have the executive branch and you have the legislative branch. And as the legislative branch looks at it, it will send it to the executive branch beforehand. They have the approval, whether to declassify and put it forward. So they will have the opportunity if the committee…” Time for another Todd interruption and diversion. 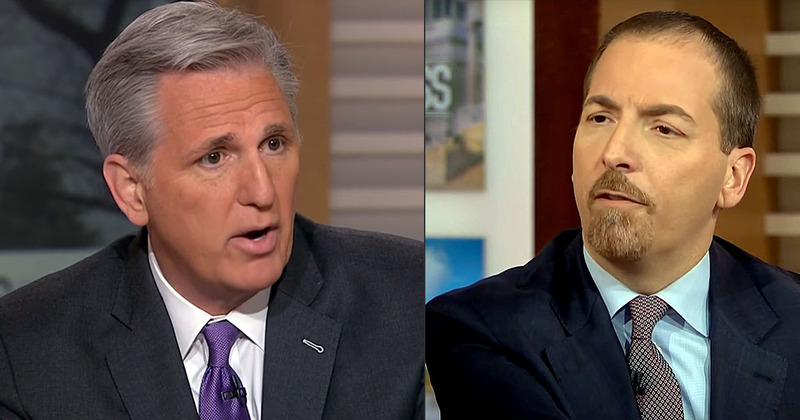 He asks, “Do you want the President to declassify this memo?” McCarthy replies, “Having read this memo I think it would be appropriate that the public has full view of it.” What’s the matter Todd, something in there you and your fellow America-haters don’t want us to know about? How much money did you get paid by Fusion GPS? How is it okay for a fake political hit piece to escape scrutiny but a memo built upon FBI information, created in a manner so as to not expose classified information, somehow improper? Why aren’t you and your fellow propagandists interested in classified documents and information being compromised when it’s located in a private citizen’s house, on an illegal server in untold counts of felonious violation of our espionage statutes? Chuck Todd has to keep up his image with the Democrats spreading his lie’s and innuendos also against President Trump ! It will bite him and the rest of the Dummiecraps sooner then they think ! They’ll dream up some reasons for not releasing it. Or, they’ll delay it and build the suspense until it can have a more direct impact on the 2018 elections. It’s just more political games.